Grand Mal Seizures also known as Tonic-Clonic Seizures are a type of generalized seizure that affects the whole brain. The Grand Mal Seizures are the most common type of seizure that is greatly associated with epilepsy. Grand Mal Seizures are usually portrayed in movies. Because of people seeing only grand mal seizures in movies and other films, there have been misconceptions that when it comes to seizures, Grand Mal Seizures is the only type. What some people do not know is that seizure can come in many different forms and symptoms, including partial seizures, absence seizures, atypical absence seizures, myoclonic seizures, atonic seizures, tonic seizures, clonic seizures, and grand mal seizures or tonic-clonic seizures. 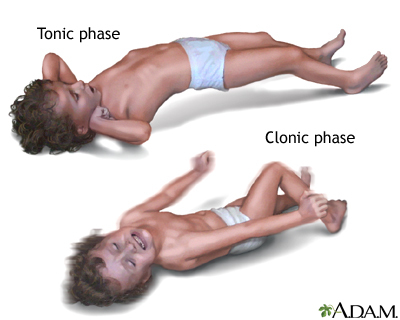 Under the 2nd phase of grand mal seizures, it is further divided into 2 sub-phases, the tonic and the clonic stage. Tonic Phase – This is when a person will suddenly experience loss of consciousness, skeletal muscles contract, and will cause the person to fall. This stage will usually last for 10 seconds to 20 seconds. During this stage, a loud scream may be heard due to air forcefully expelled from the person’s lungs. Clonic Phase – This is when a person’s skeletal muscles start to contract and relax rapidly, which causes convulsions. Convulsions usually last for a maximum of 2 minutes. This is during this stage that jerking movements of the extremities happen. For some people, after the 2nd phase of grand mal seizures, they usually fall into a deep sleep for several hours and some may experience headache, nausea, fatigue, and confusion after the convulsion. Usually, people will be unable to recall the events that happened before and during the attack of grand mal seizures.